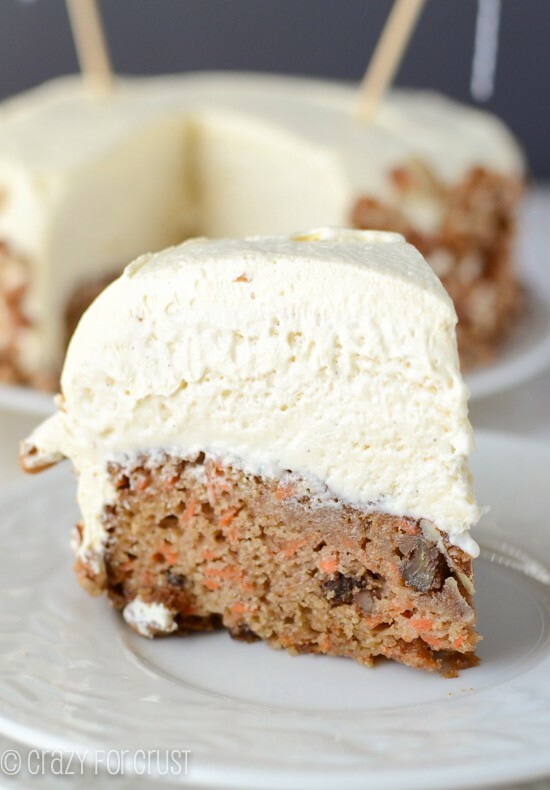 I know, you’re probably thinking that it’s not quite the season for carrot cake. In reality, all things carrot cake happen year round in the Kern household. We all love it and it’s one of my husband’s favorite desserts. Also, why should March and April have all the carrot cake fun? That’s just discriminatory, IMO. I figured since it’s Father’s Day I should share something that Mel would actually eat. And he really did; eat this cake I mean. He had 3 whole bites, awarding this post the coveted Mel Ate It tag. I made this for my sister-in-law’s birthday earlier this month. When I asked my mother-in-law what flavor to make, she returned with lemon or carrot cake. Now, we all know that I love lemon, and I’ve been just dying to turn my lemon cupcakes into a cake. But then I realized I’d make a huge layer cake and only my in-laws and I would actually eat it. Plus, I knew that if I made a carrot cake Mel wouldn’t be able to resist eating it. Normally he has no trouble turning down my desserts because they don’t wow or call out to him. But peanut butter or carrot cake are always a siren song: he cannot resist. Pretty much I made this cake for my sister-in-law to torture my husband. I’m really lucky he loves me lots. I decided to make a naked cake because I’ve always wanted to try one. Plus, I love cream cheese frosting but it can become overpowering. Not frosting the outside of the cake makes it easier to enjoy a slice because your teeth aren’t ready to fall out after you’re done and it’s a better frosting-to-cake ratio. 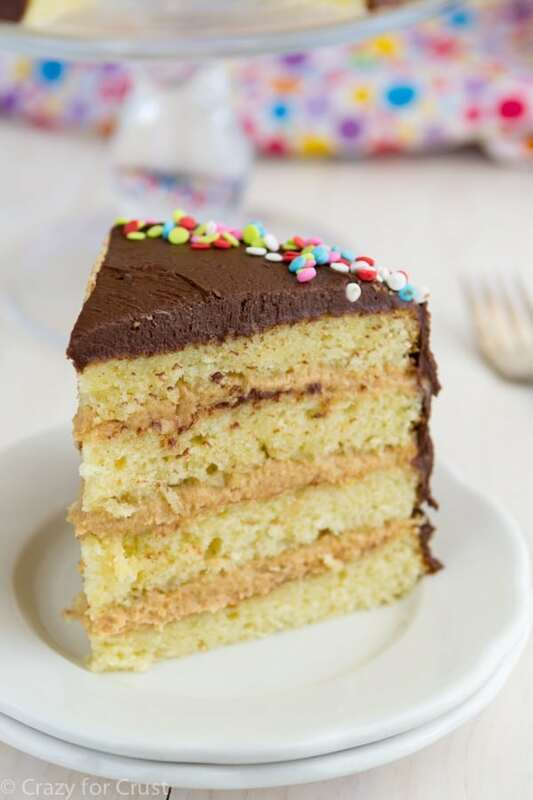 Also, I like saying “naked cake,” because I’m a 13-year-old boy. 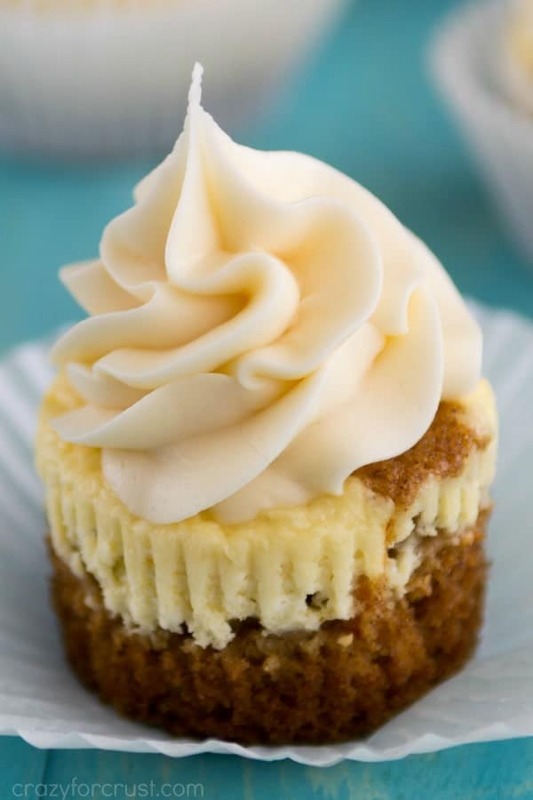 The carrot cake layers are a recipe adapted from one that’s in my cookbook, the Carrot Cake Cheesecake Cupcakes. It’s super soft from the vegetable oil and a bit of applesauce. I love the moistness that the applesauce gives the cake and by using it you can reduce the amount of oil. 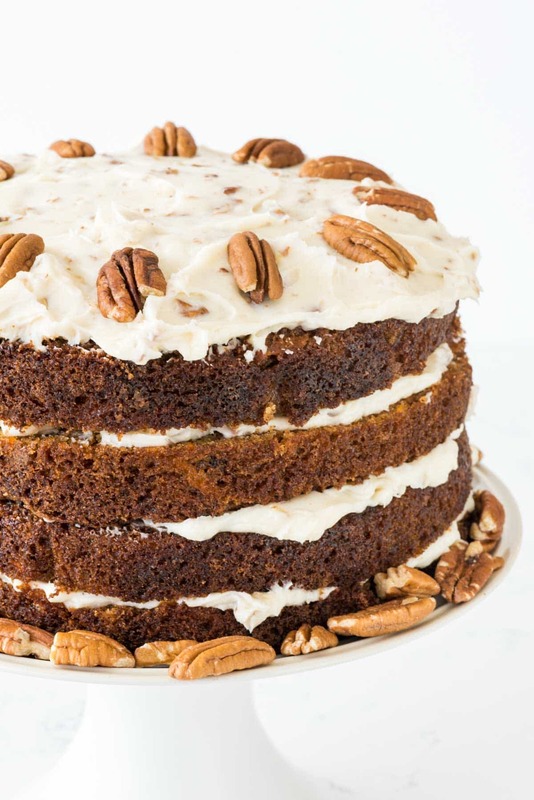 Some carrot cakes are super greasy because of all the oil. These are perfectly moist and soft because I used a combination. You won’t find pineapple or raisins in my carrot cake recipes, probably because raisins are the devil in my mind, and pineapple just freaks me out. You’re welcome to add some raisins (or even chopped pecans) to the batter if you want. And then there’s the best part: the frosting. Cream cheese frosting is the best part of any cake or cupcake, but especially this frosting. It’s not too sweet or too savory; the frosting is the perfect mix of cream cheese, butter, and sugar. And I added a whole bunch of chopped pecans to give the cake some texture and crunch. 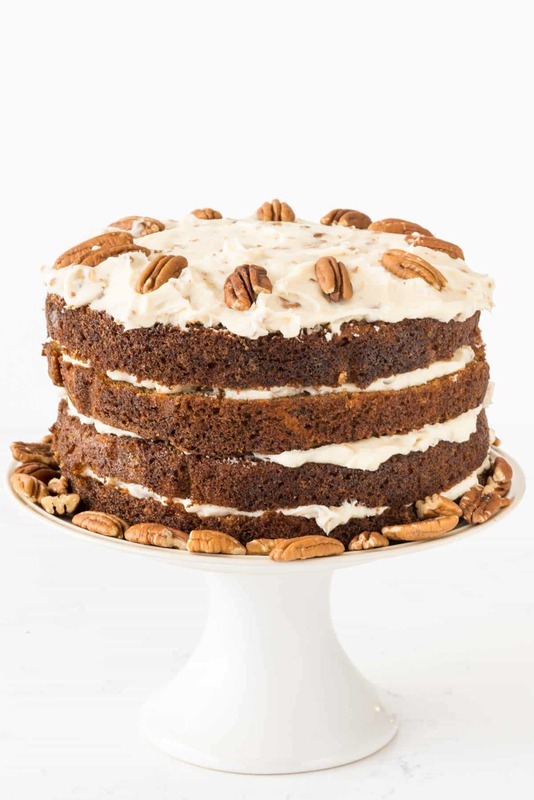 I think pecans in cream cheese frosting were meant to be! If I was making this for anyone but my husband, I’d also add some coconut in the frosting. He’s weird and doesn’t like coconut. Whenever you make this cake, it’s a show-stopper. Naked cakes are always that but this one, for some reason, screams summer gathering to me. Everyone who ate it loved and raved about it, and I hope you feel the same way! 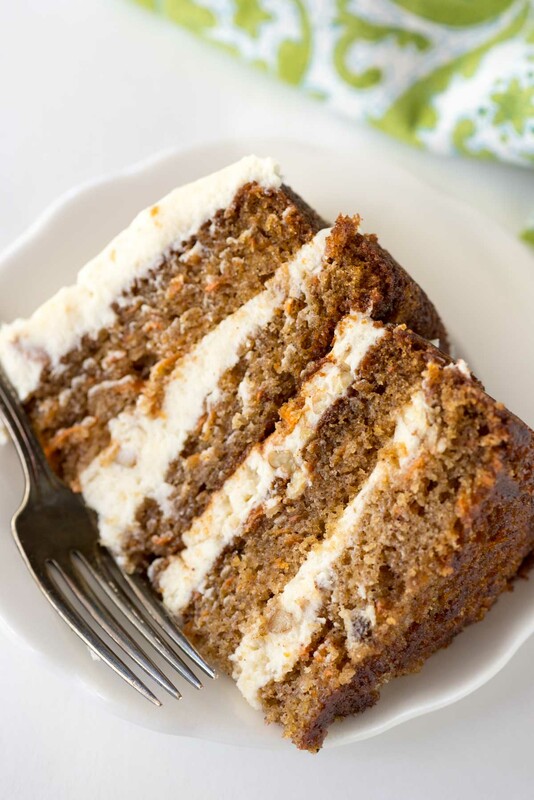 Naked Carrot Cake with Pecan Cream Cheese Icing - this easy cake recipe is the BEST carrot cake ever! Plus the frosting is to die for. Preheat oven to 350°F. Grease and flour two 8” round cake pans (or use floured nonstick cooking spray). Place a strip of parchment in the bottom of the pan that goes up the sides for easy removal. Whisk eggs until beaten, then whisk in oil, vanilla, applesauce and both sugars. Whisk until combined, then add dry ingredients and stir with a spatula or wooden spoon until just combined, then stir in carrots. Let the cakes completely cool before removing from the pan and frosting. To make the frosting: beat cream cheese and butter until smooth. Add powdered sugar, 1 cup at a time, until the mixture comes together, then add vanilla and salt. Beat until smooth, then stir in pecans. To frost the cake: I made four layers by “torting” the cake. To torte each layer, place a ring of toothpicks around the middle at equal intervals, then slice the cake in half using the toothpicks as a guide. Layer cake on cake plate with the frosting, adding pecan halves on top for garnish. You can frost the sides if you want, or leave it naked as I have. This cake looks so yummy! I love lemon desserts also! Can you recommend a bundt pan that does not stick? I love bundt cakes but need a new one and would like to buy one that a professional would buy! Thanks and thanks for a great blog!! I’m so excited to make this! Can I make the cakes the night before and will they still be moist the next day? If so, how do you recommend storing them over night? I’m short on time the day of the party and was hoping to make the frosting and assemble the cake the day of.